* My friend Missey posted a question on her blog stating “how do you want your children to remember you”. Thank you Missey for sparking some conversation. Unfortunately, I didn’t get the response I was looking for. When asked, Leah said “Mommy is always grumpy because she has 3 kids”. I guess I need to work on this. 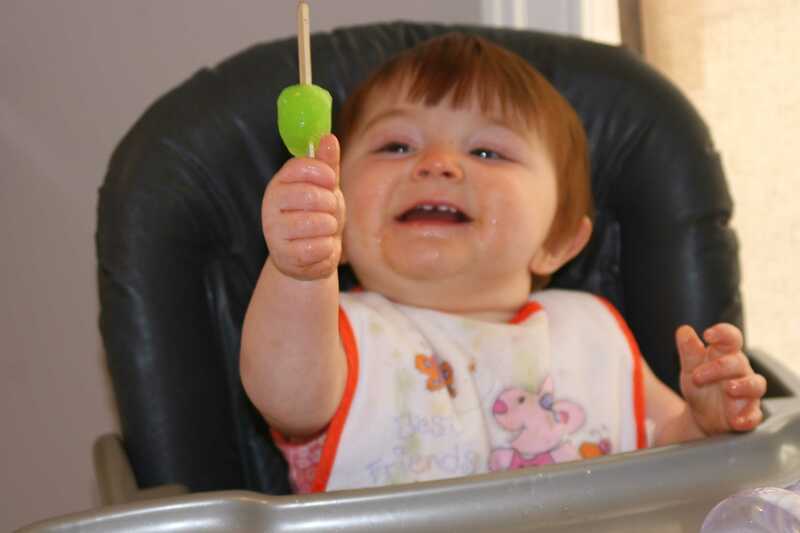 * Brooke had her first popsicle…yep, and she’s only 11 months old! That’s what happens with the 3rd child. * Brooke has become a speed racing crawler and has the knees to prove it. * Kami thinks every color is “boo”. * Today, Leah said “Mommy needs a nickname”. Still a little bitter about the “grumpy” comment, I said “should it be grumpy?”. She laughed and said “yes”. When asked what Daddy’s nickname should be, she replied “Tootie”. * We had a nice Father’s Day. Happy Father’s Day to Eric, Dad (Pappy), Grandpa Don and Great-grandpa Earl.